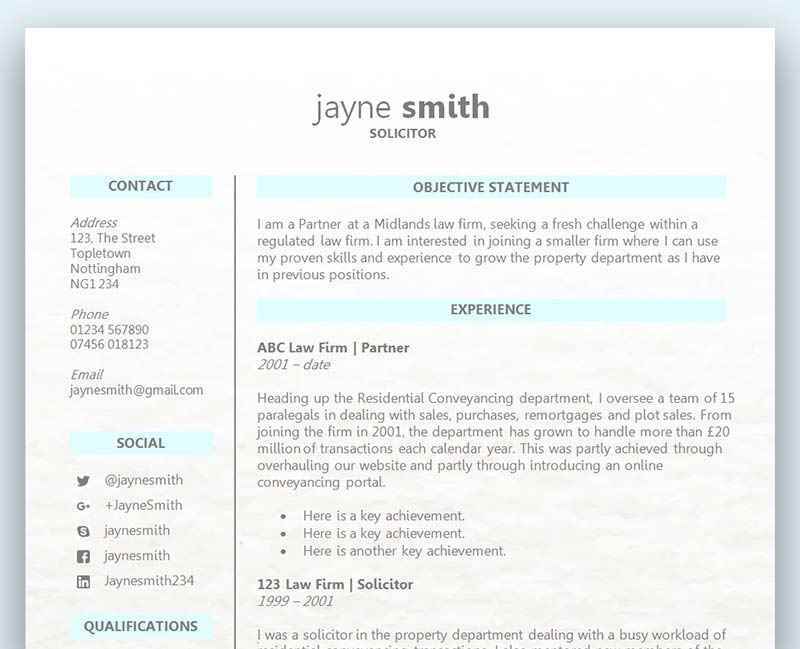 This CV template makes use of a two column layout and small blue details to add interest. It also uses the Impact font to create a strong impression with your target employer. It's easy to add extra sections if you need to, or change the current choices (work experience, education, skills, references). There's no fancy graphics or images to detract from your core skills. Two column blue accent CV template	Overall rating:	5	out of 5 based on 1	reviews. The smart heading on this CV uses the Impact font to catch the eye. The rest of the CV uses a simple logical layout which you can fully customise in Microsoft Word. The use of blue is subtle but adds a little interest to an otherwise clean and clear layout that does the job. When you send out your CV to apply for a job, you never know how many other people will be applying too. Although you may have an abundance of qualifications, skills and experience, you are likely to be facing lots of other candidates who have the same – or maybe even more. You can’t risk taking any chances when it comes to writing a great CV, and every single section and detail has to be perfect if you want to stand out from the other applicants. However, the great news is that even if you are coming up a little short in the skills department, you can still make yourself shine above the rest. After the hiring manager has quickly acknowledged your name and contact details at the top of your CV, it’s now time for them to get straight into the meat of your application. It’s vital that you get off to a strong start and make that all important great first impression. There are two ways you can do this, or even use both. Firstly, consider attaching a cover letter to make your application more personable and friendly. The structure of a CV makes for very formal reading, so a cover letter can break away from that and approach the hiring manager directly. Always address your cover letter directly to the manager by their name; otherwise this will defeat the object of making things more personable. For more information on writing a cover letter, please read our fantastic article – Top tips on how to write the perfect cover letter for your CV. Secondly, you could also (or instead of) write a personal profile underneath your contact details. Sometimes called objective or personal statement, your profile is a great way to introduce yourself to the employer. Your statement should provide a brief overview of your skills and experience which will directly benefit the company. It should set up the rest of your CV nicely! Here are some great tips on how to write a personal profile. The hiring manager will go stir crazy reading through the many hundreds of different tasks and responsibilities listed on each CV they receive. So rather than trying to list everything you’ve ever done, you should instead focus more upon your results and achievements. There is nothing wrong with listing your tasks, but you need to keep them to a minimum and only provide what you did in a ‘nutshell’ rather than getting into too much detail. You can also consider completely removing the tasks from roles which are either irrelevant to the employer, and/or are from many years ago. Usually the most recent roles are of interest to an employer, and the tasks that clearly demonstrate a direct link to the new role. Your results and past performances are also very important to an employer, and most candidates will make the mistake of omitting this information. Your performance is obviously what will matter at the end of the day, and all the qualifications and skills on the planet will not provide any indication of how you actually perform in a working environment. The secret to writing a CV that stands out from the crowd comes down to demonstrating your performance through examples, results, achievements, and numbers and figures. Employers love to see actual stats on a CV, as it gives a much better idea of how you performed. You should look to avoid cliché statements without actually backing your claims up with real hard facts. Stating that you have great communication skills is not enough to convince the hiring manager. However, explaining how you successfully negotiated contracts worth £250,000 for the first quarter of 2018, will offer a far better picture of your performance.